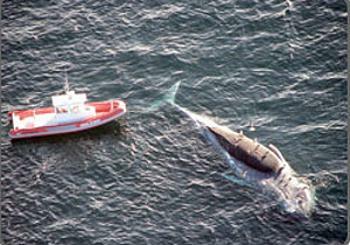 LOS ANGELES, California, November 3, 2011 (ENS) – The U.S. Coast Guard has recommended moving shipping lanes in the Santa Barbara Channel to remove ships from the areas used by whales feeding in the Channel Islands National Marine Sanctuary. The recommendation comes after a year-long Coast Guard study of the access routes for cargo ships using the busy Ports of Los Angeles and Long Beach and the Santa Barbara Channel completed in June, and released on Tuesday. The Coast Guard studied the traffic separation schemes in the Santa Barbara Channel and in the approaches to Los Angeles-Long Beach; and the approach to the San Pedro Channel from the Pacific Ocean, particularly the area south of San Miguel, Santa Rosa, Santa Cruz, and Anacapa Islands; and north of San Nicolas, Santa Barbara, and Santa Catalina Islands where an increase in vessel traffic has been identified. As a result, the Coast Guard proposes narrowing the distance between the shipping lanes by moving the southern inbound lane one nautical mile toward the northern lane, and leaving a one nautical mile separation between the lanes. The northern outbound lane would remain in place. Decreasing the width of the separation zone and shifting the southern lane one nautical mile to the north, will move vessel traffic away from the Channel Islands National Marine Sanctuary. This shift would move the southern inbound lane away from an underwater area near Santa Cruz and Santa Rosa islands where endangered blue, fin and humpback whales have been feeding on krill. The National Oceanic and Atmospheric Administration designated the shipping lanes near the near the Channel Islands National Marine Sanctuary as a “Whale Advisory Zone” after four blue whales were struck and killed by ships in 2007. Conservationists like the idea moving the shipping lanes away from feeding areas, but say cargo ships should slow down as well. In June, four environmental groups petitioned the Obama administration to establish a ship speed limit through California’s four national marine sanctuaries to protect whales. The Environmental Defense Center, the Center for Biological Diversity, Friends of the Earth and Pacific Environment say a speed limit would help protect endangered blue, humpback and fin whales from being run over. NOAA is reviewing the petition. In the last 10 years, about 50 whales have been hit by ships off the California coast. The Center for Biological Diversity says the exact numbers are nearly impossible to determine given that many accidents will go unseen or unreported. The Coast Guard’s proposal contains recommendations which would require the approval of the International Maritime Organization for implementation, says Rear Admiral Castillo. The Coast Guard will follow the federal rulemaking process for implementation of any of the proposed changes to the traffic separation scheme. This process will include consultations with the National Marine Fisheries Service in accordance with the Endangered Species Act. This will provide ample opportunity for additional comments on proposed changes to the existing vessel routing system through a notice of proposed rulemaking published in the Federal Register.